This event was organized and arranged by Gary Headrick, San Clemente Green. Gary had asked the city council for the time because the Nuclear Regulatory Commission, a few weeks earlier, had only let about half the public speak at their last hearing -- their first post-Fukushima hearing on San Onofre -- which was a complete whitewash of the dangers and risks we face. The council was surprised by how many people wanted to speak, but ultimately accommodated everyone -- unlike the Nuclear Regulatory Commission, which cherry-picked the speakers, controlled the order, and wasted everyone's time allowing SanO employees to denigrate the opposition and give mindless pep-rally presentations best left for small groups at company breakfasts, if they really feel such cheerleading should happen at all. I recorded both hearings (my video from the NRC hearing is available at my You-Tube channel and called "You Call This A Tsunami Wall?"). Here, I have presented a portion of every speaker on the issue, in order, except two: An employee who tried to explain to the council a very dangerous technical problem at San Onofre, and a former plant worker (yawn...) who told us that the daily releases of poisons into the air from a coal plant are more dangerous -- and more visible -- than the daily radiation releases from a nuclear plant (presumably true, and very old news, and not relevant since wind turbines, solar panels, and energy conservation -- the obvious alternatives to nuclear power -- don't have those problems, and coal plants can't melt down). Although we don't hear him here, the San Onofre employee does appear in one quadrant of the opening scene. His complaint, about a "technicality," a cabling issue, should, ALONE, SHUT THAT PLANT DOWN and would, if we had a working, effective Nuclear Regulatory Commission. He has made his exact same complaint in front of the NRC several times already, to no avail. The results, as usual, could be tragic. Of course, if we had an effective NRC, they would shut down ALL the nuclear power plants, not just ours. Meanwhile, in Japan, things are getting worse and worse. TEPCO admits to meltdowns in three reactors at the Fukushima Daiichi site, and thus, admits they were lying for two months about how bad things really are, since they must have known this, because of the spectrum and quantities of radionuclides being released. American "experts" must have known it, too. I just don't see how they couldn't have. The air and oceans of the world continue to be terribly poisoned, and we are all at risk of things getting MUCH worse than they already are at Fukushima. This was precisely the horrific accident people like myself have (accurately) predicted for decades. It is the accident the nuclear industry assured you would never happen. The next task -- besides whatever cleanup is possible at Fukushima Daiichi -- is to prevent it happening again. This video speaks to THAT task. New video: 9-year-old Ella says: "Please shut down the nuclear power plant." Yesterday I videotaped the San Clemente (California) Common Council meeting, where activists were seeking support from the city for a resolution asking for the immediate closure and decommissioning of San Onofre Nuclear Generating Station, in light of all we've learned from the ongoing tragedy in Japan at the Fukushima Daiichi nuclear power plant. The entire city of San Clemente lies within a few miles of San Onofre. It has few egresses. In a nuclear emergency, its people are toast and they know it. But the plant does generate a substantial amount of revenue for the city. Several dozen people spoke, including myself. Nothing was accomplished, unless the city common council deciding to write a letter to our Senators and various officials in Washington, D.C., asking them to remove the spent nuclear fuel as soon as possible counts as accomplishing something in your book (it doesn't in mine). Oh and, of course, they are going to ask the federal and state governments for hundreds of millions of dollars. Not to build up the tsunami wall at San Onofre, nor to reinforce the spent fuel areas, nor to add extra backup generators or batteries. No: To finish a planned secondary escape route! They do not seem to understand that evacuation, even with a hundred escape routes, will probably be impossible -- as it was in Japan -- because it will be too late by the time you hear there's an accident already in progress. Duct tape the windows and doors, run HEPA filters if you have electricity, and pray the cloud passes over you and on to the next house. And every road will be jammed, even if they succeed in getting funding for an alternate route out of the area. Many of the citizens who spoke were very good -- one even rode her bike some 75 miles just to get there. Only one person spoke in favor of the plant, a retired worker. Ella was a welcome alternative to the photographs of deformed Chernobyl babies which the activists felt obliged to present. If we wish to avoid that fate, we MUST shut these (and all) nuclear reactors down forever! The author has been blogging about nuclear issues for decades. The San Clemente Common Council has placed the issue of the dangers presented by San Onofre Nuclear Generating Station on its agenda for tomorrow night (May 17th, 2011). San Clemente is the nearest city to the power plant. Citizens will be given about 8 minutes to make a formal presentation, then additional time for comments. Below is a link to a proposed resolution. I've created a video of the April 28th, 2011 Nuclear Regulatory Commission hearing in San Juan Capistrano, California. The URL is below. Also shown below is a debate between myself and a 25-year former employee of San Onofre, a whistleblower who has appeared at several public hearings (and in my videos of those hearings). Those appearing include representatives from the plant's regulators and operators, as well as local citizens Gary Headrick, Steve Netherby, Gene Stone, Nancy Nolan, myself and others. It's good that we agree on the essential outcome -- that San Onofre Nuclear Generating Station should be shut down. It seems that the crux of our disagreement is whether SONGS should remain open until all of the spent fuel is removed from the site -- but to where, no one knows. If we do as you suggest -- keep San Onofre running -- I better not be right about the dangers. So, we better ignore the numerous similarities between San Onofre and Fukushima, ignore the dangers you yourself described in public hearings, and ignore everything anyone else has ever written condemning nuclear power in general or San Onofre in particular. We must ignore long lists of infractions and falsifications in the decades before the current debacle, in order to pretend that once the NRC cleans things up THIS TIME at San Onofre, Southern California Edison won't become complacent or dishonest again. San Onofre has had its share of near-misses. Everyone ignored them. Now we know what might have really happened, but we must continue to ignore them anyway. We have already ignored Chernobyl, always saying that couldn't happen with "Western" style light water reactors. Oops. But let's ignore that, too. We must ignore the recent estimate that, if we actually had the nuclear-powered energy-based economy nuclear enthusiasts envision, we would be experiencing multiple Fukushima tragedies every year. If we keep the old plants running, we will be very lucky indeed to go 25 years -- as we almost did (but not quite) between Chernobyl and Fukushima -- without another meltdown, or cascade of meltdowns. TEPCO lied. People died. SCE lied. They got their wrists slapped by the Nuclear Regulatory Commission and were told to keep lying to the public -- we'll even help you with that -- but don't lie to us. At least, not so often. Please. But we love you, you're as safe as a baby in baby carriage. Quoth the NRC to SCE. I don't happen to believe it. If we do it my way instead of yours, we turn to renewable energy regardless of whether nuclear power might have been marginally better economically -- which you would be very hard-pressed to prove -- and magically safe, which I contend is impossible for you to prove. In other words, if we choose renewable energy and could have chosen nuclear power instead, oh well. Little damage is done. The truth can always be told. We don't need annual or semi-annual public hearings about the safety of our energy source, with permanent on-site federal inspectors who can't even maintain control after 14,000 hours of inspections last year alone -- 366% above normal and still the place rots from within. We don't need any of that. If we switch to renewables, but you were right and I was wrong, we might some day realize we could have saved a little money achieving the same thing -- energy independence -- with "clean, safe nuclear power", which never had another accident anywhere, especially not at an American reactor, ever, after Cherno-- sorry, after Fukushima -- and we would regret spending a little more on energy and/or conservation than the absolute minimum we could have spent, which, you are telling me, is achievable only by continuing to run San Onofre which, you are telling me, is perfectly safe because it's run by humans who can fix everything that goes wrong when the earthquake, tsunami, faulty wiring and come-out-of-the-closet employee-based terrorism all happen at once. Nevertheless, it is precisely because of your experience inside the industry that your concerns about the potential impact of a natural disaster or a careless worker are so chilling. It's also true that you would not have reached out to the public, would not have attempted to rectify your issues with San Onofre through the legal system, would not even have contacted the Nuclear Regulatory Commission, if you thought San Onofre's management were capable of solving the problems you brought to their attention first. They've failed four different ways to solve your issues, yet I'm to trust your assertion that San Onofre can, and will, fix EVERY issue? Every whistleblower's warning? Every expert's assessment of 100-foot and 200-foot tsunami wave's can be ignored? Every allegation I've made is inconsequential, never mind that it's been proven right already, and that can't be debated anymore? I'm to trust San Onofre, when I've seen no evidence of anything positive -- they are right that the sea wall it high enough. That a previously-unknown fault doesn't run right under the plant. That no nearby fault can produce an earthquake larger than the "design basis" earthquake. That every part has not rusted away or embrittled (hardened) over the decades of use, to where a little extra shaking -- not a lot -- will break it, and in truth, the plant can't even survive a design-basis event? I'm to believe that unlike TEPCO, Edison International is an honest conglomerate, and wouldn't suffer a meltdown or two, and then not tell anyone for two months. You are not the first, the last, or the only whistleblower from San Onofre, let alone from the nuclear industry, to come forward. Nor are your stories the most chilling we've ever heard, chilling though they are. Other 25+ year San Onofre veteran employees have also -- like you -- talked to us. Have also, like you, come out of the U.S. military nuclear programs (Los Alamos, for example) before working at San Onofre for several decades. In making my own judgement that San Onofre should be shut immediately, your voice is one in a din of voices everyone should listen to, including yourself. The Nuclear Regulatory Commission tries to silence the dissenters, placate them, calm them, and then ignore them. I wish to amplify, investigate, remember and honor them. And act on what they say. This story is BIG. This is NOT merely reasonable people agreeing to disagree about how a fly ball was caught. San Onofre Nuclear (Waste) Generating Station has its jackboot on our throats as we speak. It is killing us, as well as our neighbors, our friends, our families. Our pets, our livestock, our fauna, our flora. It is threatening mass devastation. Around Fukushima, fetuses will be spontaneously aborted, infants will be born deformed, cancer rates will zoom, mothers will cry, children in pain will ask why. Fathers will head off to work at the plant, to die. All this is already happening. Right now they are culling the livestock around Fukushima. Hundreds of thousands of horses, cows, pigs, goats, and sheep, and millions of chickens and turkeys. They are "destroying" all those that haven't died already of starvation, dehydration, radiation or exhaustion. None of the animals know to run from radiation. Thanks to TEPCO's lies, the people didn't know, either. Daily nuclear releases from commercial reactors DO kill, and they ARE large. Such releases are dwarfed only by things like nuclear weapons testing, Three Mile Island, Chernobyl, and, most of all (we now know...) by Fukushima. San Onofre is highly vulnerable to mother nature, human frailty, terrorism, and errors in judgement. Fukushima is a tragedy for all of northern Japan and the whole world, not just a 10-mile area. The spectrum of isotopes being released have half-lives from fractions of a second to thousands of millennia. All are highly carcinogenic in minute amounts, and all are being released continuously in massive quantities. Criticality events may still be occurring or might occur again at any time. Radioactive steam and water continues to be released. The groundwater, the sewage system, the seas... everything is being poisoned as we speak. Worse than that, if there's an expert here who can help them, they shouldn't be talking to me! So I assume you feel helpless as to what to do next. Make a note of that in your arguments for continuing to operate SONGS. That all you could do in Fukushima if you were there now is to suit up, run in, turn a valve a few revolutions or attach a pipe or something, absorb your maximum permissible dose, and run out. In Japan they are carefully keeping the workers at around 150 mSv and suddenly are allowing a lifetime exposure of 250 mSv, 150 mSv higher than the previous Japanese worker's limit (which was twice our own) just so that those workers can continue to work in the nuclear industry afterwards. Smart thinking? No: It's purely criminal! But you say we merely respectfully disagree. I say the playing field in not level. San Onofre remains open. Many of the workers who will be needed at Fukushima will die from their exposures, assuming the "LNT" (Linear, No Threshold) dose model is correct. As long as any nuclear power plant is running, it is especially vulnerable to consequences not unlike Fukushima, and perhaps far worse. A jetliner smashing through the dry cask field at San Onofre would probably be worse than Fukushima, for instance. The greatest levels of vulnerability can be reduced substantially and instantly by shutting the reactors down. Nothing else can remove that much risk so easily. It was the running reactors that caused virtually ALL the problems at Fukushima, with the exception of the spent fuel pool at unit four, which appears to have been neglected, and then damaged by the explosion at unit three. And Unit 4's main problem was that the fuel was still extremely "hot" having been removed from the reactor fairly recently when the reactor was shut down for maintenance. The devastation from Fukushima probably wouldn't have happened if the reactors had been shut down for even a few months prior to March 11th, 2011. But they weren't. We have the chance to do that here, and, perhaps, thus save SoCal. Removing all of the spent fuel from the site BEFORE shutting down the reactors, as you suggest we should do -- aside from being impossible -- is putting the cart before the horse. It substantially increases the risk to all seven+ million of us who live and breath in SoCal, and millions more around the world. After all: Are you saying Fukushima did not have wonderful engineers and builders and designers also? Were they good enough or weren't they? Were they your equals or weren't they? Are you claiming to be super-human, as they thought they were? As everyone in the nuclear industry MUST think? The rest of us make mistakes. We also accept overwhelming evidence as fact. I'm referring to evacuation plans. They only go out to 10 miles, or sometimes 12. It would be more appropriate if they went out 50 or 100 miles, or maybe 500 miles. I'm referring to the ignorance of the media, the public, our government employees, and the so-called "experts". I'm referring to honesty from management after the accident starts (let alone, today). It looks like Fukushima Unit 1 was a core-meltdown from the get-go. No wonder Americans 50 miles out were told to evacuate, and the Ronald Reagan high-tailed it away as fast as its jobs-training-program-for-SONGS-reactors could haul it (which, in reality, is no faster than a conventional carrier can go. One should note, during war, for protection, the carriers must stay deep within the fleet, which can only travel at the speed of the slowest vessel). SONGS-era technology has sunk Japan. Surely you are not claiming that Fukushima's Boiling Water Reactors are the problem since they are not Pressurized Water Reactors? Surely that's not what makes ours safe instead? Do you think the public would buy that excuse, especially considering the higher pressures a PWR operates at, and thus, the extra stresses involved throughout the system in the name of "efficiency"? I can't think of any significant difference, really. After rereading your letters, I ask: What do we really disagree on? Is it the statistical chance of an airplane landing on a dry cask? Is it the total havoc such an event would create? Is it the epidemiological reasons to think such catastrophic events would kill X number of people, versus Y? I'm not sure. As far as I can tell, the only thing we actually disagree on is the order of events for shut down. In my opinion, shutting down the plants immediately would hardly mean getting rid of the workforce. True, some would become wind turbine installers and so on, but many people would have to remain at the site for years or decades, at least until all the spent fuel is removed (somewhere!?!). Shutting down the plant gives the fuel a chance to cool and stops the ever-growing collection of used nuclear "piles". We are more than 65 years into nuclear technology. There's a perfectly sound reason the nuclear waste problem hasn't been solved yet: Ionizing radiation destroys its containers. Shipping the radioactive waste anywhere on earth doesn't really solve the problem. Certainly putting it in an earthquake-prone hole, as you suggest, doesn't solve the problem, either. Magic materials, let alone cost-effective magic materials don't exist. With your experience, you should know prohibitive costs constantly prevent you from using all sorts of materials that would actually work a lot better than steel and cement for containment of radionuclides -- gold, for instance, though I hear iridium would be even better (and vastly more expensive). Society thinks its nuclear engineers have actually engineered real solutions to the problems associated with nuclear energy. It's simply not true. What we are really doing is playing Russian Roulette with everyone's lives. Fukushima changed everything except, I suppose, the nuclear industry's thinking. >Yucca Mountain is full of problems, it should never open, and almost surely won't. Yes, the waste should be moved to a less populated area (name a place you'd like to poison forever...) but as long as the plants remain open, at least five years' worth of fuel would have to remain on site as it would not be cool enough for transport until then. Plus the loads in the reactors. >Plus ANY waste solution is decades in the future at best. And merely a pipe dream, at best. I've studied Yucca Mountain, looked over half a foot of documentation on it, and every other proposal for decades.... if you think that's the solution, well, good luck with that. It isn't. >I'll admit that I wish it were possible for there to be a way to make nuclear power safe. After all, that would solve everything! And I'll even admit that San Onofre tried -- many of the employees tried. 95% perhaps. But that wasn't good enough and never will be. You said it yourself: One dropped wrench that one guy doesn't say anything about. 99.9% honest workers would be nice, but not enough, and not attainable. >>1 ) The canisters that are built at SONGS are built to the highest standards possible. When the project was designed we self imposed an ASME Ã¢Â€ÂœNÃ¢Â€Â and Ã¢Â€ÂœNPTÃ¢Â€Â Stamp on the fabrication and design of the canisters. This was done at great extra expense but gave us an independent inspector to oversee the project (ANI & ANIS ) . I can tell you with 100% confidence that canisters 1 thru 36 were built to the highest standards in the world. I can also attest to the quality of these casks which are / were the best in the world. I can not speak for any canisters that were built after I left. There was NEVER a welding issue that had anything to do with canister quality. This issue was an isolated case of one individual that willfully choose not to follow a specific parameter called out in a procedure. The activity that he choose not to follow had no affect to quality of fabrication or welding. This was strictly a case of willfully violating a procedure. That is a serious and in-excusable offense in the nuclear industry as it should be. >>I know you fellas think that SONGS should be closed. I am not a civil engineer , seismologist or geologist. I do have 25 years at SCE and have been in every nook and corner of all three Units at SONGS. Speaking from my experience and as a private (retired) citizen I would much rather have both power plants fully operational with a full crew in the control room , maintenance , health physics , engineering ect. on site overseeing both spent fuel pools and the dry cask stored fuel. Our fight is with the Federal Government for not opening a depository on the West and East coast as was agreed upon prior to building any of these 104 nuclear plants. >>Our focus should be on making SCE more transparent , ensuring they allow folks to speak up without fear of retaliation , demand an open and collaborative work environment and hold the NRC along with SCE accountable. We should ensure there is every possible contingency covered in case of a Japan-like event. We should assume that is possible not have a seismic study to prove it is not. I have never seen any seismic studies that can determine what Mother Nature has in store for us. If we need a better and higher tsunami wall it should be built. Back-up emergency diesel generators could be built on higher ground on the other side of I-5. We need to have some way to remove hydrogen from the spent fuel buildings in the event of an uncovering of the fuel. We could use a reservoir with ample borated water supply to fill and refill 100 spent fuel pools. It never what we do know it's what we don't know. >>The bottom line is our energy should be put into removing the SPENT FUEL which is not going to happen for several (20? ) years. The community has a responsibility to ensure the Site is run safely. I would be willing to help in this effort . Shutting the Plant down makes the problem even more dangerous that ship has sailed. REMOVE THE SPENT FUEL , work with the Utilities to get the DOE , DOT , NRC and Congress to open Yucca Mountain as soon as possible. We all want what is best for the community as do folks working at SONGS. There must be a way where we can work together to do what is best for all. >>Years of procrastination in deciding on long-term disposal of highly radioactive fuel rods from nuclear reactors are now coming back to haunt Japanese authorities as they try to control fires and explosions at the stricken Fukushima Daiichi Nuclear Power Station. >>A pre-earthquake view of fuel rods at the Fukushima Daiichi Nuclear Power Station. >>A daily tracker of the damage at the two imperiled nuclear plants. >>Loading high-capacity pumps from the United States Navy for use in the effort to cool Reactor No. 3. >>Some countries have tried to limit the number of spent fuel rods that accumulate at nuclear power plants: Germany stores them in costly casks, for example, while China sends them to a desert storage compound in the western province of Gansu. But Japan , like the United States, has kept ever-larger numbers of spent fuel rods in temporary storage pools at the power plants, where they can be guarded with the same security provided for the plants. >>Figures provided by Tokyo Electric Power on Thursday show that most of the dangerous uranium at the power plant is actually in the spent fuel rods, not the reactor cores themselves. >>The electric utility said that a total of 11,125 spent fuel rod assemblies were stored at the site. That is about four times as much radioactive material as in the reactor cores combined. >>Now those temporary pools are proving the power plant's Achilles' heel, with the water in the pools either boiling away or leaking out of their containments, and efforts to add more water having gone awry. While spent fuel rods generate significantly less heat than newer ones do, there are strong indications that some fuel rods have begun to melt and release extremely high levels of radiation. Japanese workers struggled on Thursday to add more water to the storage pool at Reactor No. 3. >>Helicopters dropped water, only to have it scattered by strong breezes. Water cannons mounted on police trucks Â— equipment designed to disperse rioters Â— were then deployed to spray water on the pools. It is unclear if that effort worked. >>Richard T. Lahey Jr., a retired nuclear engineer who oversaw General Electric's safety research in the early 1970s for the kind of nuclear reactors used in Fukushima, said that the zirconium cladding on the fuel rods could burst into flames if exposed to air for hours when a storage pool lost its water. >>Zirconium, once ignited, burns extremely hot and is difficult to extinguish, added Mr. Lahey, who helped write a classified report for the United States government several years ago on the vulnerabilities of storage pools at American nuclear reactors. >>Very high levels of radiation above the storage pools suggest that the water has drained in the 39-foot-deep pools to the point that the 13-foot-high fuel rod assemblies have been exposed to air for hours and are starting to melt, said Robert Albrecht, a longtime nuclear engineer who worked as a consultant to the Japanese nuclear reactor manufacturing industry in the 1980s. Under normal conditions, the rods are kept covered with 26 feet of water that is circulated to prevent it from growing too warm. >>Gregory Jaczko, the chairman of the United States Nuclear Regulatory Commission, made the startling assertion on Wednesday that there was little or no water left in another storage pool, the one on top of Reactor No. 4, and expressed grave concern about the radiation that would be released as a result. >>The 1,479 spent fuel rod assemblies there include 548 that were removed from the reactor only in November and December to prepare the reactor for maintenance, and these may be emitting more heat than the older assemblies in other storage pools. >>Even without recirculating water, it should take many days for the water in a storage pool to evaporate, nuclear engineers said. So the rapid evaporation and even boiling of water in the storage pools now is a mystery, raising the question of whether the pools may also be leaking. >>Michael Friedlander, a former senior nuclear power plant operator who worked 13 years at three American reactors, said that storage pools typically had a liner of stainless steel three-eighths of an inch thick, and that they rested on reinforced concrete bases. So even if the liner ruptured, "unless the concrete was torn apart, there's no place for the water to go," he said. >>Mr. Lahey said that much of the water may have sloshed out during the earthquake. Much smaller earthquakes in California have produced heavy water losses from sloshing at storage pools there, partly because the pools are located high in reactor buildings. >>Its like being at the top of a flagpole, and once you start ground motion, you can easily slosh it, he said. >>A version of this article appeared in print on March 18, 2011, on page A12 of the New York edition. >>Items #2 and #6 are particularly scary; they show there's an awful lot of fuel on site! >>>Thanks Rick. Any idea how much capacity (number of years) this can continue? Are you satisfied that the welding procedures you had to call them out on have been done correctly now? >>>Any chance you can answer how much spent fuel we've accumulated? How much capacity do we have? Any concerns about what is already in storage, like bad welding? >>>I believe the correct figure is at least 3,000,000 and maybe 4,000,000 pounds of spent fuel -- or more! >>>794 tons as of 1995. >>>I tried calculating by adding 250 pounds per day to the 794 figure for 16 years -- that's another 3,000,000 pounds or so right there, but I think I heard 3 or 4 million pounds total... but maybe it's 5,000,000. Maybe it depends on if you include the fuel rod assemblies, or just the pellets, or what? >>>It's a lot, that's for certain! "Radionuclides, once deposited by rainwater or air onto the ground, will find their way through the ecosystem." Scratch three more nuke plants. The easy way. Japan's Prime Minister, Naoto Kan, has called for closing the Chuba Electric Power Company's Hamaoka reactor site. So scratch three more nuclear power plants. The easy way. And if Japan didn't have about 45 other nuke plants still operating, this would be bigger and better news. But it's a start. And if America's leaders were to do the same thing -- say, close San Onofre, Diablo Canyon, and Indian Point's reactors immediately -- THAT would be even bigger news! And an even better start. As with the Hamaoka reactors in Japan, there is plenty of criticism that America's faulty nuke plants can't survive much of anything; that the populations around them cannot be evacuated; that the safety records speak for themselves and cry out for closure. But this is good news, and we need all the good news we can get! (1) ALERT: Japan orders 3 nukes to close over seismic dangers! Subjec: ALERT: Japan orders 3 nukes to close over seismic dangers! Maybe its' time to see if we can get Loni Hancock to follow through with hearings that address emergency planning that didn't happen on 3-21 or 4-14. TOKYO­Japanese Prime Minister Naoto Kan on Friday submitted a formal request for a halt to all electricity production at Chubu Electric Power Co.'s Hamaoka nuclear power plant in the central Chubu region due to concerns about the plant's preparedness for a major earthquake. The move immediately affects the No. 4 and 5 units, which are currently operating with an output of around 2,500 megawatts. In addition, it cancels the potential resumption of electricity production at the No. 3 unit, which has a capacity of 1,100 megawatts and is currently on a planned maintenance outage. In announcing the shutdown, Mr. Kan noted that the Science Ministry estimates an 87% chance of a massive magnitude 8 earthquake in the region over the next 30 years. "I have requested Chubu Electric to suspend operation of all nuclear reactors at Hamaoka. The reason for this is for the safety of the Japanese people," Mr. Kan said in a televised news conference. He said the shutdowns would be in effect until appropriate safety measures can be taken, but gave no time frame. The move will worsen the already constrained power supply situation as Japan enters its highest-demand summer period following the shutdown of nuclear plants following the devastating March 11 earthquake and tsunami. But Kan said that the government hoped to avoid major disruptions due to the additional outages. "I believe that we can overcome the risk of a power shortage with the cooperation of the Japanese public," Mr. Kan said. Kyodo News quoted the company as saying that it had ordered a suspension of all operations at the plant. Mr. Kan's high-profile closure of the plant comes after criticism that the facility was not adequately prepared for a major quake and that the government was not doing enough to protect against the risk of a second nuclear power plant crisis after the Daiichi crisis became the second-worst nuclear accident on record. Briefing reporters after Mr. Kan's statement, Trade Minister Banri Kaieda said that the government was asking neighboring Kansai Electric Power Co. for potential assistance. However, Kansai Electric announced just hours earlier that it was shutting down its own Tsuruga No. 2 plant with an output of around 1,100 megawatts after finding elevated radiation levels in its cooling water. It stressed that there was no release of radiation in the incident but needed to make checks on whether one or more of the fuel rods might have been damaged, allowing small amounts of fuel to leak out. A Kansai Electric spokeswoman said the company would try every alternative measures to provide sufficient power, including asking help from adjacent Chubu Electric, Chugoku Electric Power Co. and Shikoku Electric Power Co. Nevertheless, if many of the nuclear power reactors supplying electricity for Kansai remain idle and if temperatures are high this summer, Japan's second-largest power utility, based in Osaka, may have to ask its customers to save electricity, including implementing planned power outages. In response to the March 11 quake and tsunami, Mr. Kaieda has ordered over the past two months all nine utilities operating nuclear power plants to enhance safety against earthquake and tsunami such as equipping more backup power sources and making doors water-proof. The nine utilities have implemented some of the measures and reported to the government with schedules to undertake the remaining safety work. ­Mari Iwata contributed to this article. Below is an absolutely stunning, powerful article by Joe Giambrone, published in CounterPunch today and forwarded to me by Tim Seitz in Canada, along with Tim's letter to Stephen Harper, newly-reelected Prime Minister of Canada. The only thing I would change is I would change the word "bordering on" to "amounting to". See if you don't agree. Also, a very useful interview from Fairewinds Associates, also just posted today. (1) Where is all that Fukushima radiation going, and why does it matter? (2) "The atomic power industry, it can be proved, has been an unprecedented catastrophe for mankind." (2) "The atomic power industry, it can be proved, has been an unprecedented catastrophe for mankind. " Now I hope you will use your newly given power to rid Canada of all its Atomic Power applications. Children in Belarus, Ukraine and certain provinces of Russia tell us what to expect from a massive radiation contamination such as Japan is currently experiencing. Radiation attacks the young to a harsher degree than it does adults, and yet we do know that it kills adults. Radioactivity causes numerous illnesses including terminal cancers, and not just from a large initial dose but over time from absorbed emitting particles inside the body. A senior nuclear adviser to the Japanese Prime Minister, professor Toshiso Kosako resigned in protest from his government. This as the Japanese government raised the level of permissible exposure to schoolchildren twenty fold, from 1mSv/year to 20mSv. The atomic power industry, it can be proved, has been an unprecedented catastrophe for mankind. One of the world's leading experts on radionuclide contamination is Dr. Yury Bandashevsky based in Minsk, Belarus. Near Chernobyl's "ground zero" Bandazhevsky has published hundreds of scientific papers and has studied the radioactive contamination absorbed by children there for decades. The parents of northern Japan had best investigate Dr. Bandashevsky's dietary recommendations. 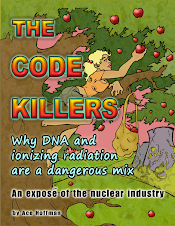 He's found that apple pectin helps remove radioactive cesium-137 from the body. However, food grown and animals grazed in contaminated regions will pass along radiation to human populations for centuries. The Japanese reliance on fish will soon produce another shock to their nation as larger fish absorb more radioactive particles up the food chain. "Chronic Cs-137 levels over 30 Bq/kg body weight is often associated with serious cardiovascular diseases 2." For children with cesium 137 in excess of 50 Becquerels/kg body weight, "pathological disorders of the vital organs or systems will occur 3." These levels can produce grotesque malformations in newborn babies and increase the risk of spontaneous abortions. The U.S. Center for Disease Control (CDC) says, "Both 134Cs and 137Cs emit beta particles and gamma rays, which may ionize molecules within cells penetrated by these emissions and result in tissue damage and disruption of cellular function 4." Expecting Japanese mothers should flee the north of Japan as quickly as possible. Abandon the region for the sake of their children's safety. Fetuses are in imminent danger and are many times more vulnerable to radiation than are adults. How much radiation is Japan bathed in right now? Nature magazine online reported that soil 40km northwest of the plant contained, "Cesium-137 levels of 163,000 becquerels per kilogram (Bq/kg) and iodine-131 levels of 1,170,000 Bq/kg, according to Japan's science ministry 5." Tellingly, the new official "exclusion zone" is only a 30km radius from the plant. This means that those living atop the irradiated soil described above will not even be prompted to leave. Most will not. They will eventually return to life as usual. Only the colorless, tasteless, odorless radioactive isotopes will poison their families ceaselessly for the rest of their lives. Cesium, strontium, iodine and other radionuclides will continue to attack life forms in that contaminated environment despite any hollow assurances to the contrary. Plutonium, the most toxic substance on earth, has been detected at eight different monitoring stations in Korea. Radioactivity is a highly contested and controversial subject. Vast caches of medical evidence are routinely ignored in the mainstream media. At the nerve center of the controversy is the International Atomic Energy Agency (IAEA), whose entire purpose is to promote the atomic power industry worldwide. Many don't know, but the IAEA has the authority on all health matters concerning radiation, both military and civil. The World Health Organization can simply be blocked ­ by the IAEA ­ from publishing its findings concerning radioactive disasters like Chernobyl. This exact scenario occurred in 1995 under the tenure of WHO Director Dr. Hiroshi Nakajima 6. A Swiss documentary team discovered that Dr. Nakajima's 1995 international conference of "700 experts and physicians" was prevented from publishing its findings on Chernobyl by the IAEA. The 2004 Swiss film Nuclear Controversies documents this battle between doctors and scientists on the scene vs. the IAEA. Regarding the IAEA, Dr. Nakajima said, "for atomic affairs, military use and civil use, peaceful or civil use they have the authority. They command 7." The elephant in the room is that word "military," and the desire of Western militaries to pummel other lands with "depleted uranium" (sic) munitions. As NATO currently plasters Libya with uranium tipped bombs, it must deny that the uranium contamination will harm the civilian population there. That admission alone would constitute a confession of war crimes, and so the fiction continues. Radiation attacks DNA and causes horrific malformations, sudden mortality, and diseases that persist for the rest of the person's life. Several films have documented the radiation effects on the children of Chernobyl including the Academy Award winning Chernobyl Heart (2003). This film shows harrowing images of deformed infants and numerous teenagers who suffer from thyroid cancers and other thyroid diseases. Fewer than 20% of children in the nation of Belarus can be classified as "healthy," according to official government studies. A Ukrainian study found that, "for each case of thyroid cancer there were 29 other thyroid pathologies 8." Dr. Bandashevsky found further health effects at even lower levels of cesium contamination. For "children having 5 Bq/kg more than 80% are healthy, while having 11 Bq/kg only 35% of children are healthy 9." Chernobyl Heart, The Battle of Chernobyl (2006) and Nuclear Controversies (2004) have been available streaming online for all to see. The evidence that radiation destroys the lives of entire populations is irrefutable. "As discussed previously in the section on the attribution of effects to radiation exposure, because presently there are no biomarkers specific to radiation, it is not possible to state scientifically that radiation caused a particular cancer in an individual 10." By their own logic it is also not possible to scientifically rule out that radiation caused the epidemic of cancers found in the highly contaminated regions. But, that's exactly what the UN has shamelessly done in a series of reports that deliberately under-count the deaths from the Chernobyl catastrophe. While the IAEA refuses to accept medical consequences of the radioactivity it promotes, it does acknowledge that radiation has spread from the crippled Fukushima plant. Readings as high as 25 Megabecquerels per sq. meter iodine-131, and 3.7 Megabecquerels per sq. meter cesium-137 were reported "at distances of 25 to 58 km 11" from the still out of control plant. These numbers should prompt massive evacuations at much greater distances than the official exclusion zone (read: uninhabitable zone) of 30km. Facing that reality would render a large chunk of Japan a wasteland with economic costs beyond calculation. The numbers of refugees would surpass anything that the government could possibly manage. The absolute insanity of atomic power would instantly become an unavoidable fact to the entire (sane) world. All exposures to radiation increase the risks of cancer, and there is no such thing as a "safe dose." This is the determination of the National Academy of Sciences 12, the EPA 13, NRC 14, CDC 15 etcetera. Thus, when a population is exposed to any increase in radioactive particles, some percentage of people and animals will be adversely affected. The exact number is difficult to determine, but estimates are made through extrapolation. Dr. Chris Busby has predicted "400,000" cases of cancer for the population within 200 kilometers of Fukushima 16. That includes the suburbs of Tokyo. Studies from Europe after Chernobyl were used in his calculations. Cancers include thyroid, leukemia, pancreas, prostate, lung, skin, bone ­ every type of cancer that exists. This is what radiation does to living organisms. The evidence is clear. Children living "in contaminated regions, in a radius of 250 - 300 km from Chernobyl show an increase in mutations 17." From the years 1987 to 2004, "the incidence of brain tumors in children up to 3 years of age doubled and in infants it increased 7.5-fold 18." Thousands of studies from Russia, Ukraine, Belarus and the surrounding countries were compiled in 2009 by Dr. Alexey Yablokov and Drs. Vassily and Alexey Nesterenko. Chernobyl, Consequences of the Catastrophe for People and the Environment was published by the New York Academy of Sciences and cites 5,000 studies. Forty percent of Europe was dosed with significant radiation. Radioactivity spread across the northern hemisphere where it continues to affect human health to this day. The most contaminated provinces show human devastation directly correlated to radiation levels. Gomel province in Belarus had 90% healthy children in 1985, the year before the meltdown. By 2000, "fewer than 10% of children were well 19." Effects were directly related to the levels of contamination, eliminating other possible factors. Rare deformities in infants increased radically. Severe Congenital Malformations (CMs) "such as polydactyly, deformed internal organs, absent or deformed limbs, and retarded growth increased significantly in the contaminated districts… officially registered CMs increased 5.7-fold during the first 12 years after the catastrophe 20." This is what the parents of Northern Japan should expect if they decide to stay. This is what the promotion of high risk atomic power has bequeathed to the next generations of those who live near the contaminated zone. The IAEA's methodology showed obvious holes in the counting of victims, post-Chernobyl. Stillbirths aren't counted at all. The reality is that up to 2004, "the estimated total number of miscarriages and stillbirths in Ukraine as a result of Chernobyl was about 50,000 21." Those are fifty thousand human deaths in the single nation of Ukraine that did not even merit a mention in the UN's so-called "official death toll." How many really died from Chernobyl's meltdown? The Yablokov/Nesterenko book places the death toll at about one million. "Thus the overall mortality for the period from April 1986 to the end of 2004 from the Chernobyl catastrophe was estimated at 985,000 additional deaths. This estimate of the number of additional deaths is similar to those of Gofman (1994a) and Bertell (2006). 22"
Three independent studies arrived at similar findings. As all nuclear plants regularly and routinely discharge harmful radioactive particles, which all governments admit are unsafe, the case is pretty clear. Nuclear power must be abolished while there is still enough uncontaminated arable farmland to sustain us. In a strictly moral sense, these reckless plants endanger millions of other people's children, perhaps 12,000 human generations yet to be born 23. Radioactive power generation places us in jeopardy at risk for catastrophic illnesses. This is a gross deliberate violation of millions of people's human rights. Plutonium remains a threat to future civilizations. This reckless, uncontrolled release of radioactive isotopes has fouled the earth. The people of Japan should remember the people of Belarus. Birth defects in children "whose mothers live in contaminated zones is twice as high as compared to those, whose mothers live in clean regions 24." Joe Giambrone is a filmmaker and author of Hell of a Deal: A Supernatural Satire. He edits the Political Film Blog. He be reached at: polfilmblog at gmail. 1. World Health Organization, International Agency for Research on Cancer IARC, Monographs on the Evaluatiion of Carcinogenic Risks to Humans, Vol. 78 Ionizing Radiation Part 2: Some Internally Depostited Radionuclides, 2001, IARCPress, Lyon France, p. 343. 3., 17., 24. The Chernobyl Catastrophe and Health Care, By Dr. Michel Fernex, Professor emeritus, Medical Faculty of Basel, F-68480 Biederthal, France. 4: Center for Disease Control Publication p157-c2, CESIUM, 2. RELEVANCE TO PUBLIC HEALTH, CDC website. 6., 7. Nuclear Controversies, 2004, Swiss TV, Film by Wladimir Tchertkoff, Feldat Film Switzerland. 8. ,18., 19., 20., 21., 22. Consequences of the Catastrophe for People and the Environment, Alexey V. Yablokov, Vassily B. Nesterenko, Alexey V. Nesterenko, 2009, Annals of the New York Academy of Sciences, Vol.1181. 9. V.B. Nesterenko's report at the International conference "Medical Consequences of the Chernobyl Catastrophe: results of 15-year researches", June 4-8, 2001, Kiev, Ukraine. 14. NRC website, Fact Sheet on Biological Effects of Radiation, "This dose-response hypothesis suggests that any increase in dose, no matter how small, results in an incremental increase in risk." 15. Center for Disease Control website, Prenatal Radiation Exposure: A Fact Sheet for Physicians, "However, the human embryo and fetus are particularly sensitive to ionizing radiation, and the health consequences of exposure can be severe, even at radiation doses too low to immediately affect the mother. Such consequences can include growth retardation, malformations, impaired brain function, and cancer." 16. Dr. Chris Busby, Reuters, http://www.youtube.com/watch?feature=player_embedded&v=S0H-mtsdsgg. 23. Al Jazeera, April 4, 2011, No safe levels' of radiation in Japan by Dahr Jamail, quoting Dr. Kathleen Sullivan. Ace: You're missing reference 24, plus also 17-22. Take a look. Who needs Osama bin Laden anyway? Who needs Osama bin Laden and Al Qaeda anyway, when we've got the Nuclear Mafia and their lapdog regulators to do us in? Item #2 (below) is a recent report about the Brown's Ferry General Electric Mark 1 Boiling Water Reactors -- which are the same design as the reactors in trouble in Fukushima. All three reactors at Browns Ferry were suddenly forced to SCRAM during storms earlier this week when offsite power was lost after tornadoes tore up scores of power lines. The reactors are currently in "cold" shut down (one isn't quite there yet...). "Cold" is a relative term, of course. None of these reactors should EVER be restarted. Period. But we all know there's no stopping the TVA. Browns Ferry is the site of the most notorious fire in U.S. commercial reactor history, in 1975. But fires didn't stop 'em. These tornados won't stop 'em. Apparently only a meltdown -- or a cascading series of meltdowns like in Japan -- will stop the TVA (another spoiled child of Al Gore Sr.). Meanwhile, George Monbiot has published a "how to become a journalist" article, revealing his secret: Just pick a topic other journalists know even less about: "It's surprising how quickly you can become an "expert" in a particular field: simply because so few other journalists will know anything about it. You will find opportunities, and opportunities will find you." He's certainly done that with nuclear power! NEW YORK ­ A nuclear power plant in Alabama that lost power after violent thunderstorms and tornadoes on Wednesday will be down for days and possibly weeks but the backup power systems worked as designed to prevent a partial meltdown like the disaster in Japan. The Browns Ferry nuclear power plant, one of the biggest in the country, provides power to 2.6 million homes. It has three reactors that are similar in design to the Fukushima Daiichi reactors crippled by the earthquake and tsunami in Japan on March 11. "The reactors will remain shut until we have restored the reliability of the transmission system," said Ray Golden, spokesman for the Tennessee Valley Authority, which owns and operates the 3,274-megawatt Alabama plant. When the plant lost power, the reactors automatically shut down and emergency backup diesel generators kicked in to cool the nuclear fuel. In Japan, the reactors also automatically shutdown when they lost power due to the earthquake but the backup generators were wiped out by the tsunami, allowing the fuel to overheat. The repairs to the U.S. reactor's transmission lines would take days and could possibly take weeks, Golden said, but the plant itself was undamaged. The tornadoes and thunderstorms left a trail of destruction across northern Alabama and northern Mississippi on Wednesday, killing at least 131 people in Alabama, according to Alabama's Governor Robert Bentley. The storm knocked out power to about 300,000 homes and businesses, primarily in the northern parts of Alabama and Mississippi, Golden said. In addition to the Browns Ferry nuclear power plant, the Tennessee Valley Authority operates several other facilities and provides power to about 150 municipal utilities, which distribute electricity to some 9 million people in seven states. The federally owned power generator said its two nuclear power plants in Tennessee -- Watts Bar and Sequoyah -- were largely unaffected by the storm. Sequoyah continues to provide power to customers and Watts Bar was already shut for scheduled maintenance when the storm hit. As of 6 a.m. EDT, the Tennessee Valley Authority had restored 12 large transmission lines but still had another 78 out of service, said another spokesman, Scott Brooks. Two of the units are cooled to a safe temperature so that the water around the reactor's core will not boil away -- as happened at Japan's Fukushima. The third unit should be in cold shutdown soon. The Browns Ferry nuclear power plant is located in Decatur on the banks of the Wheeler Reservoir along the Tennessee River about 170 miles north of the Alabama state capital of Montgomery. It has three units -- the 1,065-MW Unit 1, the 1,104-MW Unit 2 and the 1,105-MW Unit 3 -- which are of similar design to the Fukushima Daiichi reactors. "The nation's top nuclear regulator cast doubt Thursday on whether reactors in the U.S. are prepared for the type of days-long power outage that struck a nuclear power plant in Japan"
Just a couple of days and we can have a very nasty problem. That's from the head of the NRC, he should know. Protect our nuclear power plants! Osama bin Laden is dead, killed in Pakistan today. We have the body. We MUST protect our nuclear power plants!!!! They are surely going to be targeted (see below). This is a very dangerous time. I hope our politicians understand that! Please tell them that extraordinary measures MUST be taken immediately! Terrorists have threatened to unleash a "nuclear hellstorm"
AL QAEDA terrorists have threatened to unleash a "nuclear hellstorm" on Europe if Osama bin Laden is captured or killed, leaked documents have revealed. Senior al Qaeda operative Khalid Sheikh Mohammed told interrogators at Guantanamo Bay they were prepared to kill tens of thousands of innocents. Sheikh Mohammed, mastermind behind the 9/11 atrocity, warned there was a nuclear bomb ready, hidden somewhere in Europe. He said al Qaeda was actively trying to recruit Heathrow ground staff to help it target the world's busiest airport. The threat was contained among thousands of top-secret files given to whistleblowers' website Wikileaks. The papers detail interrogations of more than 700 terror suspects at Guantanamo Bay detention camp and were written by officials at the Cuban base. Sheikh Mohammed's file reportedly says he was plotting attacks in Asia, Africa, America and Britain for "the greatest economic impact". Godspeed, indeed! Maybe we'll get on Oprah - if we hurry! Thank you, dear readers -- I'm blushing (see below). Thank you very much! The new book only happened because someone asked for a short document to hand out at the then-upcoming Nuclear Regulatory Commission hearing held last Thursday in San Juan Capistrano, California. Of course it helped that I had been collecting hundreds of images for the past six weeks... I thought about what was needed for a day or so, and started creating the document on Wednesday, the day before the event, having decided to try to "say it with pictures" in a one page flyer. Almost immediately it didn't fit on a page, hence the new book. At the hearing, even Victor Dricks (public affairs spokesman for the NRC's Region 4 district) asked for a copy! And I'm fairly certain a copy ended up with the executives of Southern California Edison too, or even Edison International's CEO, who was there. After all, they would at least want to know what they're up against, right? This coming week, another subscriber, a reverend, will be trying to deliver copies in Washington D. C. (I overnighted several dozen copies to him over the weekend, and anyone else who wants printed copies should contact me by email). A lot of people believe we can shut down San Onofre. A lot more people believe we should, but are afraid it would impact our economy or cause rolling blackouts or something bad like that. They know something worse COULD happen, but they also feel such disruptions WILL happen if we shut SanO. It's true that shutting San Onofre would impact our economy. People would be put to work building renewable energy systems, money would not be poured into the nuclear rat-hole, and cancer rates in the communities surrounding San Onofre would go down, saving money, pain, and resources. Most importantly, the CHANCE of a disaster would be significantly reduced. As to rolling blackouts, the last time California was forced to close three of four nuclear reactors (due to fires and various extended, unexpected maintenance issues at three of them) we did, indeed, have rolling blackouts. However, the blackouts were later proven unequivocally to be Enron-related and politically motivated. The artificial blackouts were given as a reason to relicense the reactors and approve the installation of new steam generators. That was ten years ago. Ten years ago, we came that close to getting San Onofre closed, and maybe Diablo Canyon too. But we failed. Failing again may be disastrous. Anyone who doesn't understand the risks we all face now, after Fukushima, probably works in the industry with rose-colored glasses and a fat paycheck each week. Or pays too much attention to the main stream media, who, of course, have been downplaying the magnitude of the nuclear disaster in Japan, along with the government of Japan (and Hillary Clinton, too). Keep up the heat, folks. We can get California nuke-free if we try. I hope some newspapers will consider reviewing my two books together. Not many books (or even booklets) are created and then travel around the world so quickly, even with the power of today's Internet! Who knows? Maybe it'll end up on Oprah! If so, we better hurry -- 19 days left! Just spoke with Diane Feinstein and gave her Ace's booklets. In her speech she spoke about the nuclear power plant, and the issue of the spent fuel rods . Long term storage is unacceptable and she said we need to rethink our nuclear energy policy . I spoke to her for a minute and gave her the two booklets and our protest flyer. I explain that we were supporting her effort and Barbara Boxer's effort to get seismic studies and that we were trying to get the plants decommissioned and transit to renewables since SONGS only provides 10-12% or less energy and shut off one extra light could save that much. Sac Bee took my picture talking to her! More later. Just handed Bernie Sanders Ace's two booklets and told him we were fighting the NRC to decommission San Onofre. He nodded as he was being whisked away. Another brilliant publication by Ace!!!! I'll send it to my web and to my contacts. like a time bomb...One large quake... and its another Fukushima. "Best wishes, and give 'em hell!" You are truly my hero. I have been trying to write a book for 20 years and I'm not off of the ground. Brilliant work by Ace Hoffman! READ WHAT HE TELLS US BELOW, about the 20 page online little book he has produced. Titled SHUT SAN ONOFRE, it applies to ALL NUKE power-plants! Ace has produced a very powerful message. Read and study it yourself! Forward it to all your family and friends! Ask them to pass it on too! Send it to every politician you know! Or don't want to know! Even here in Australia - we don't have nukes, but we mine vast quantities of uranium! My strongest thanks to Ace for what he has offered us all!